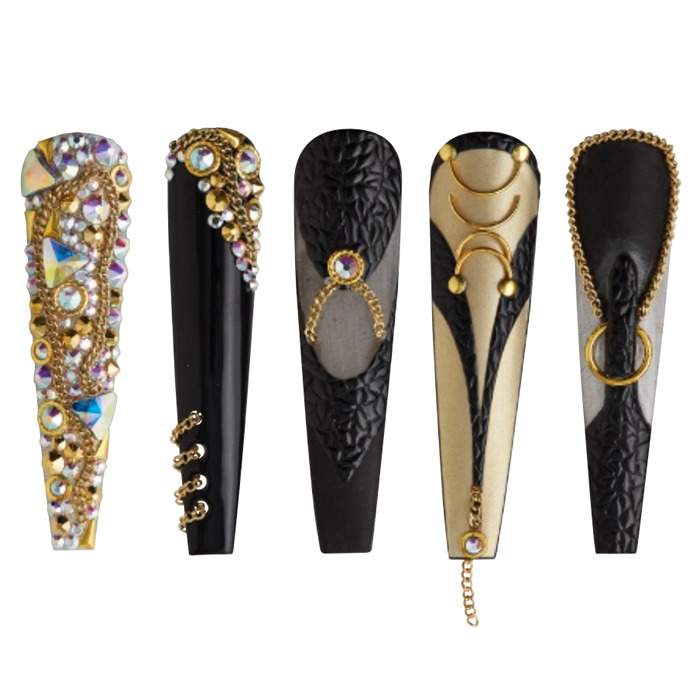 High-fashion leather inspires bold nail tips. 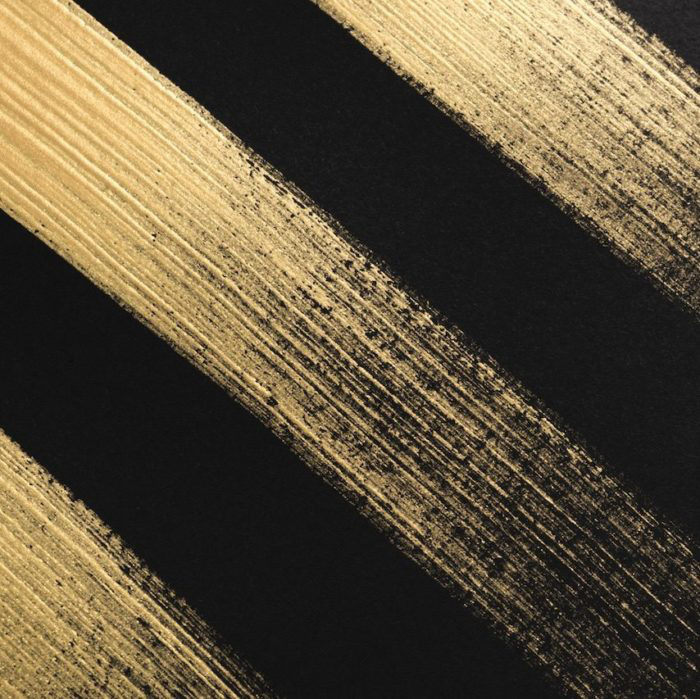 Gold Colored Thick Strokes Pattern on Black Paper Background Directly Above View. TIP! For each “grain” detail applied, flash cure for two to five seconds to ensure that the gel doesn’t blend together. Once the desired design is achieved, fully cure. 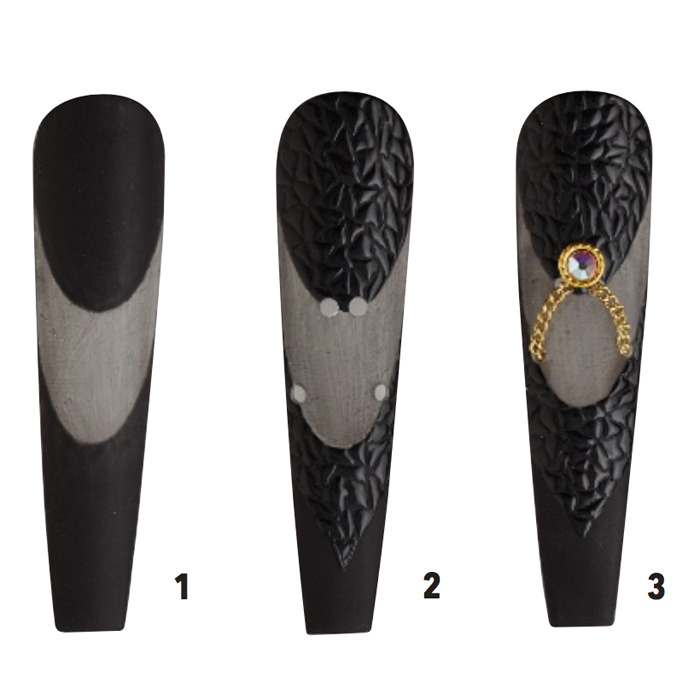 Step 1 Apply black gel polish at the cuticle and free edge, creating a negative space oval in the center of the nail. Apply sheer black polish to the negative space. Seal with matte gel top coat. Remove the inhibition layer. Step 2 Use a builder gel or thick no-wipe top coat to create small droplets on the nail to emulate leather grain. 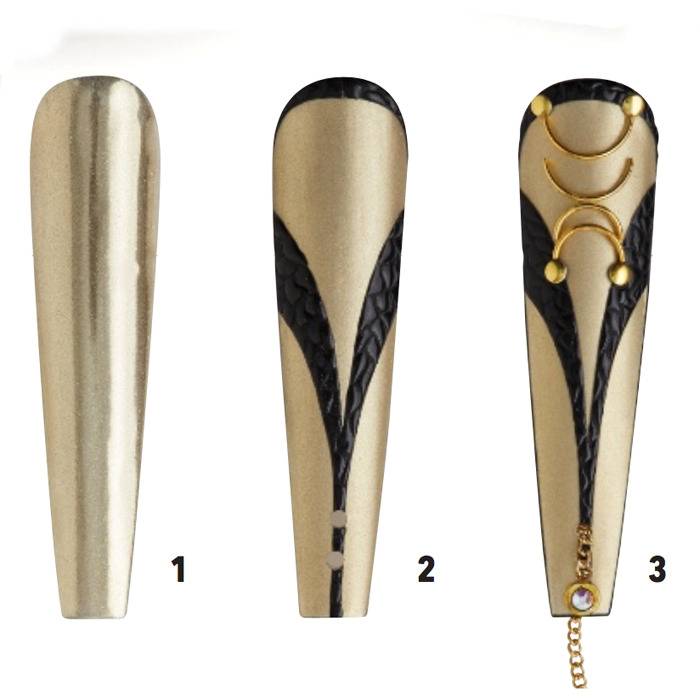 Step 3 Use an e-file to drill four small holes into the sheer black section of the nail tip. Thread a gold accent chain through the holes and secure with gem gel. Use gem gel to apply the jewel at the center of the nail. Seal the design with a no-wipe top coat. Step 1 Apply two coats of gold shimmer gel polish. Follow with no-wipe top coat. 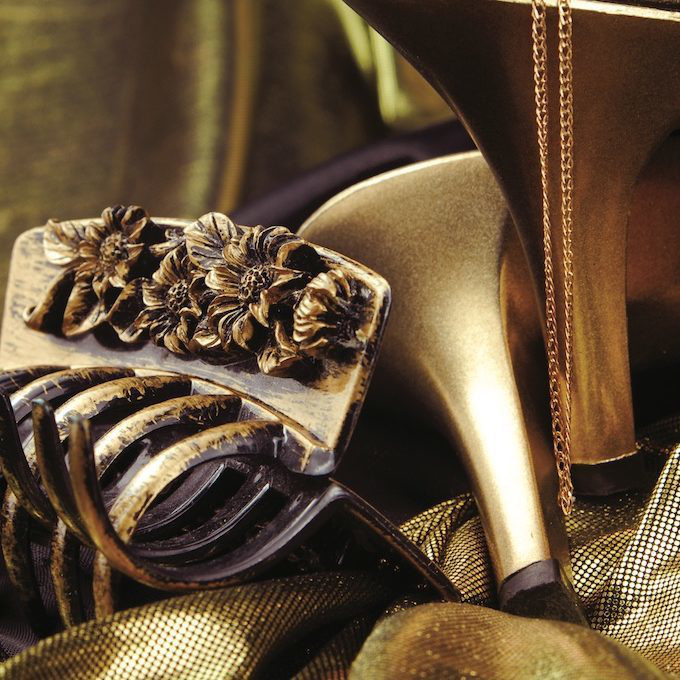 Apply gold chrome powder to the entire nail. Step 2 Paint an accent line along the cuticle with black gel polish. Paint a curved “V” shape, starting from each sidewall and connecting at the free edge. Use a detail brush to outline the sidewalls and cap the free edge with black gel polish. Seal with matte top coat. Then wipe the inhibition layer. Step 3 Use a builder gel or thick no-wipe top coat to apply small droplets to create a leather grain design on the nail. Embellish with chains and jewels, adhering with gem gel or nail glue. Drill two holes at the free edge with an e-file and insert a dangling chain. Step 1 Apply black gel polish to create a sharp point from the cuticle toward the free edge. Place a small bead of clear acrylic at the center of the nail, fading it down toward the free edge. Place a small gold ring in the center of the acrylic. Step 2 Apply black gel polish over the fully cured acrylic, and bring the black down to the free edge to create an upside-down stiletto heel. Place small droplets of builder gel or thick no-wipe top coat on the nail to create leather grain. Step 3 Using a dry-brushing technique, apply a small amount of white gel polish around the leather grain where it meets the matte black. Seal with matte top coat. Use gem gel or nail glue to adhere a chain around the matte black to accent the cuticle.